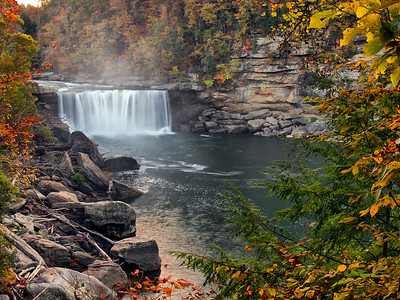 Located in the southernmost section of Kentucky, Cumberland Falls is the mother of southern waterfalls. 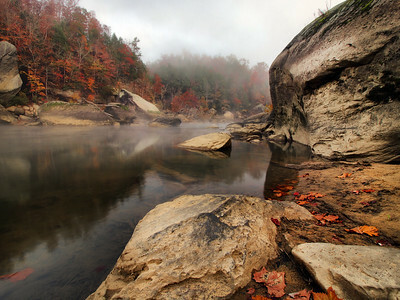 Nearby is the Big South Fork National Recreation area is shared with bordering Tennessee. 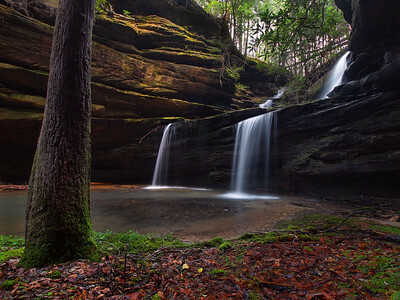 BSF is similar to Red River Gorge in landscape and geology except 3 times the size and the mountains are twice as high. 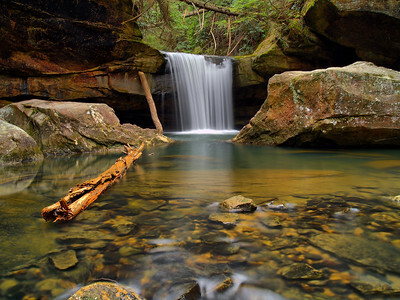 This gallery also covers the Stearns District of Daniel Boone National Forest, Mill Springs at Lake Cumberland and Monticello, KY as well as the Tennessee section of the BSF and Picket State Forest, also located in Tennessee. 1930's Chevrolet Truck Barthell's Mining Camp Big South Fork National Recreation Area McCreay County, Kentucky Perhaps I should just keep my mouth shut, but the Big South Fork National Recreation Area which spans the border of both Tennessee and Kentucky just 25 miles to the west of I-75 is the hidden gem of the National Park System. Arches, waterfalls, a wild river, overlooks, and yes! A train. Two weekends ago myself and my other half Lisa rode the Big South Fork Railway a 3 hr trip that takes you from Stearns, Kentucky into the recreated Blue Heron Mining Community. I'm going to give the train ride a huge two thumbs up, what a treat! Along the way you pass by the privately owned Barthell's Mining Camp, a reconstructed 1910 mining camp. Years ago myself and my good friend Jason Haley stopped by here out of curiosity. Although we didn't stay long we got to see several cool things while walking around the property and wanted to return. I've tried several times to return, each in the off season, which unbeknownst to me, they close for the winter. When Lisa and I passed through on the train a couple of old vehicles caught my eye along the tracks and then seeing that someone was there I just had to stop by when our ride was over. Located just outside the park property Barthell's is like travelling back in time, featuring a company store, a bath house, a doctors office, a barber shop among several other things you can tour a real mine and you can tour the grounds as well for a fee which helps the owners care for the property. There are 12 mining homes on the property that can be rented for lodging while staying in the area too. Lisa and I didn't have much time for tours but we were glad we stopped by as we learned that we are definitely going return in the future for a stay. Before we left we grabbed a couple shots of the abandoned automobiles along the railroad tracks, with the permission of the owners. Next time I'm down there I will to have to thank them as this turned out to be one of my all time favorite abandonment photographs I have ever taken. 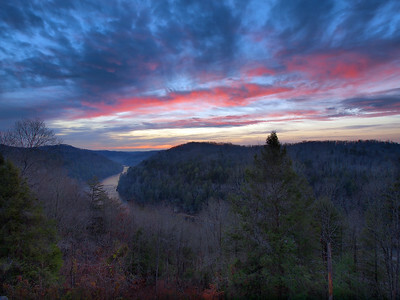 Buzzard Rock South Fork Cumberland River Daniel Boone National Forest McCreary County Kentucky Ever since I saw my first photo from this unbelievable overlook I've been dying to make a visit and last week I finally got the chance! 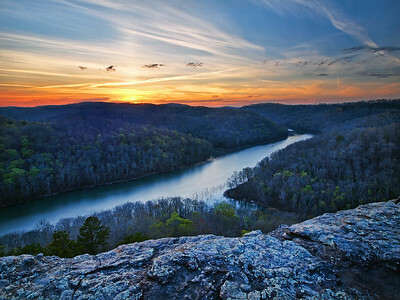 Located in the Daniel Boone National Forest in McCreary County, Kentucky, Buzzard Rock has one of the best river views in the state, and it looks westerly too! Perfect for sunset! 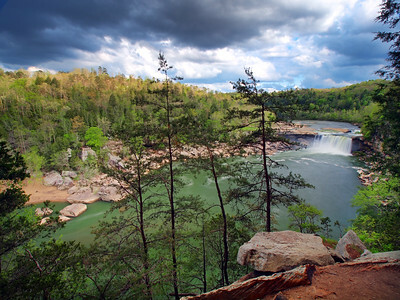 We had spent longer than anticipated on the Eagle Falls trail at Cumberland Falls and I was a bit concerned about time considering none of us in our group knew precisely where Buzzard Rock was. I was thinking trying to find Garland Bend instead when we got texts from good friends Greg Davis and Chris Morris giving us the location and it turned out it was only 20 minutes away! I hopped in good friend Jeff Burcher's Jeep and good friends Jeremy Chapman and Dave Halbig hopped in Jeremy's truck and off we went! Keep in mind that I had been riding with Jeff for the last three days and nowhere during that time did Jeff give an inkling that he could drive like a NASCAR driver, because he he began driving like the rear of the Jeep was on fire during the journey to overlook. I seriously think we set a land speed record to an unmarked parking lot along a gravel road. Quickly we got out grabbed our gear and hurriedly followed an unmarked well worn trail about a mile out to the outcropping where we met up with good friends Chris and Don Hunter with ten minutes left to spare before sunset! Great friends, an awesome overlook, a great sunset, and a sun pillar, it certainly doesn't get much better than that my friends! 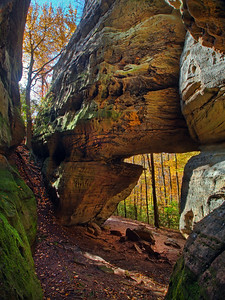 Chimney Arch Great Gulf Natural Arch Recreation Area Daniel Boone National Forest McCreary County Kentucky When it comes to shooting natural arches I have found that light plays a huge factor. 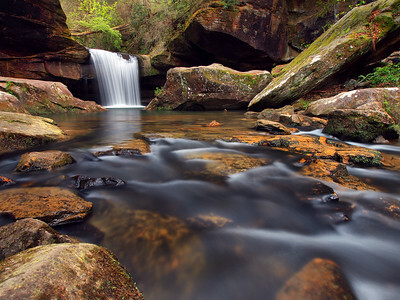 Unlike waterfalls where hard light usually completely ruins the day, with an arch a sunny day doesn't mean a thing. In fact most of my favorite arch photographs that I have taken have been shot on a sunny day. The same can be said of this little known trailside beauty that myself Adam Thompson, Mervin Wood and Rodney Beck visited a couple weeks ago. 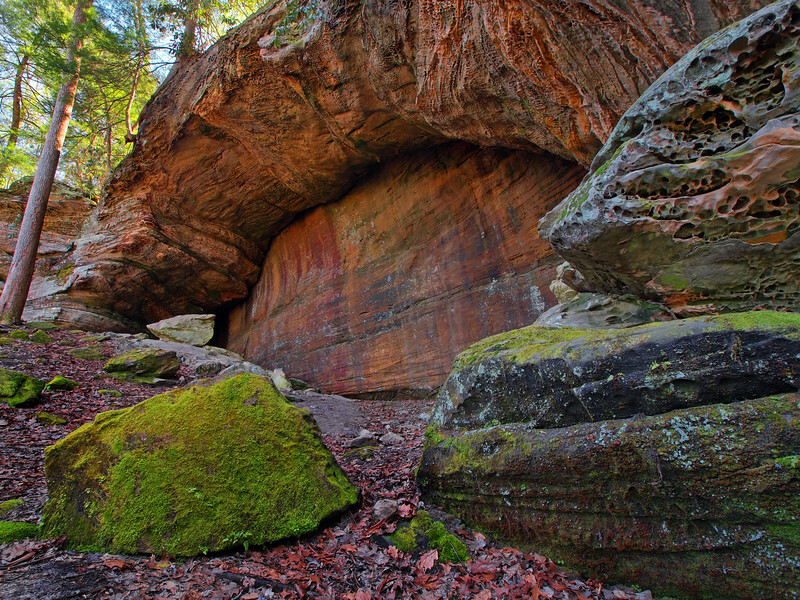 Located in the Great Gulf area of the Daniel Boone National Forest in McCreary County, Chimney Arch sits unsuspectingly a little over a mile along a side trail at the Natural Arch Recreation Area. Hands down one of the most difficult arches I've ever shot, it's unusual structure made compositions difficult and morning light compounded the problem. Not to be discouraged I went at it anyway and was pretty satisfied with the results! Coal Branch Natural Bridge Coal Branch Big South Fork National Recreation Area Kentucky It's unusual for me to take a trip to Kentucky's Cumberland Falls/Big South Fork Area and come away with more natural arch photographs than waterfalls but it happened on this latest journey that we went on, in fact I shot 13 new to me arches. 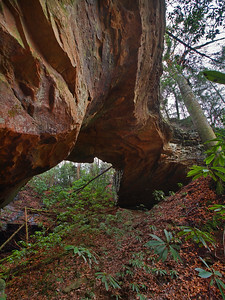 Featured here is the Coal Branch Natural Bridge and it was one of my favorites I visited on the trip, at 34 ft. tall and 80 ft. across it's larger than average. 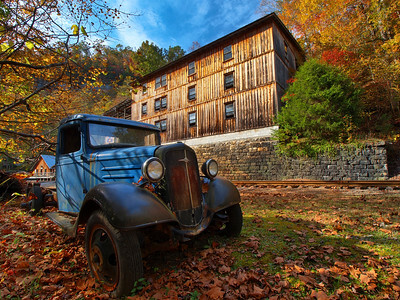 The journey to the bridge was just as much fun as getting to see it, as it is located just 100 ft into the Daniel Boone National Forest from a private land owner. Not to be the trespassing type Chris and I decided to park on a forest road about 1/2 mile away and skirt the National Forest boundary off trail. A light drizzle was falling as we began our journey which began downhill, crossing a small stream where we came to a 20 ft. tall cliff line, while following cautiously behind us 3 local dogs barked incessantly at us. Massive boulders that had separated from the cliff made for an interesting landscape as we made our way through the rhododendrons that had grown between them. Eventually we came to a place where we could scramble up the cliff and eventually on to a plateau. Fighting through God's Barbed Wire (as Chris likes to call them) aka thorn bushes we made our way across, then down off the plateau and then back up to onto another where after a short distance we found the bridge nestled in the cliff line. When you first look down on it you don't realize how large it is as the rhody's obscure the base below. At this point I was a little worried that my fear of heights was going to kick in but the scramble down wasn't as bad as it looked. Although the trek in was pretty aggravating it was well worth the effort to see this beauty. Something else that impressed me about this arch was the massive poplar you can see to the right. Seriously, the base was huge! All in all this was a great arch and a great experience and I do look forward to a return trip to this arch if I ever get the chance! 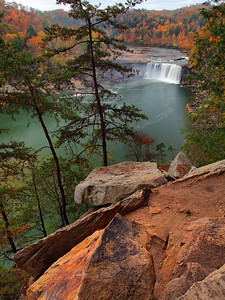 Cumberland Falls Cumberland River Cumberland Falls State Park McCreary and Whitley Counties, Kentucky My trip to Cumberland Falls this past Autumn had one specific goal in mind, shoot Cumberland Falls. Earlier this year I was contacted by Kentucky Monthly Magazine wanting to do a feature on my waterfall photography and when selecting my photographs for the article I realized that I had only one photograph that I liked of this falls. In the past 6 years I had visited the falls during a dry spell only once, all the other times were during major rain events and my interest was in the many other waterfalls in the area. So, I decided to plan a trip that centered around the highest volumed waterfall in the Eastern US south of Niagara Falls. Nicknamed The Niagara Of The South, in my opinion it is the gem of the Kentucky State Park system, there are several easy traditional vantage points to view the falls but that doesn't necessarily mean it is easy to photograph. In fact I think it might be the hardest waterfall in the state to capture. Much of it has to do with the spray that is created by the falling water as a 125 ft wide curtain of water drops 68 ft into the river. There are a few other things that make it hard to shoot as well, the closer overlooks there's lots of garbage that accumulates on the boulders at the base and far way there is no foreground interest. Something new to me was this little window I found along the trail to the furthest overlooks, I had never seen it before and what really caught my eye was how the tree line along the river looked like it had been scaled back, perhaps the effects of the flood events from earlier this year. But after stopping and absorbing this scene before me I came to realize that I absolutely loved this perspective of the falls. In my opinion the second best vantage point of Kentucky's most impressive natural feature. Cumberland Falls Cumberland River Cumberland Falls State Park McCreary/Whitley County, Kentucky For years now I'd been wanting to see Kentucky's Cumberland Falls with a low flow, I've been to the falls 10 or so times in the last 5 years but every time was during a rain event when the other falls in the area had the perfect conditions and "The Big Falls" as I call it, was a big blobby mess. 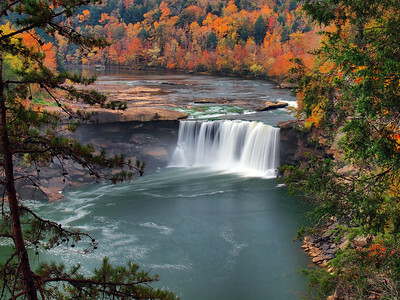 This year, I decided that I was going to travel to the area with different intentions in mind: view Cumberland Falls during a dry spell and peak fall foliage and not worry about anything else. To my amazement, not only did it work out, but it worked out better than I could have ever hoped. This view is from the Eagle Falls trail, what I consider one of Kentucky's prettiest hikes. Nicknamed "The Niagara Of The South" it's the highest volumed waterfall in the eastern United States south of the Niagara Falls, at 68 ft. high and 125 ft. wide you can see why. The falls also boasts one of only two predictable moonbow events in the world, where on a clear night during a full moon and the two days prior and two days afterwards, the light of the moon passes through the mist which creates an arch of white light. I tried shooting the moonbow too, a week later, and I'll just say I'm not going to post those photos. I've still got to work on that technique. Cumberland Falls Cumberland River Cumberland Falls State Park Kentucky Another perspective of my hike to shoot Kentucky's Cumberland Falls from the trail side cliff of the Eagle Falls Trail with my good friend Greg Davis. Early morning cloudy skies set up perfect shooting and viewing conditions at almost near peak fall foliage. Another bucket list item checked off! 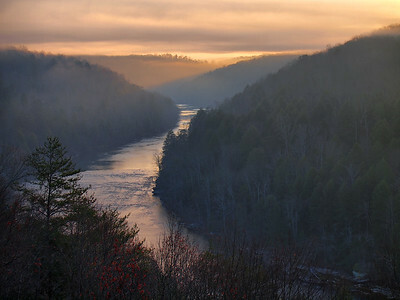 Sunrise Cumberland River From DuPont Lodge Kentucky My second Autumn trip of 2015 to Cumberland Falls featured some waterfalls and lots of arches and my good friend Christopher Morris, however my highlight of the trip was on Halloween morning. Staying in the DuPont Lodge at the State Park our original plan was to get up and run over to the overlook at Three Beavers, however when we awoke it was evident that clouds had moved in. Less motivated to make the run over to the overlook I decided to go up to the observation deck at the lodge which gives an awesome eastern view down the Cumberland River and see what was happening. When I stuck my head out the door to have a peep, far off in the distance there was a hint of red at the horizon, so I made a bee line to the car and grabbed our tripods. I dropped off Chris's at the room and told him what was up. He asked me to keep him posted if anything was happening and I headed back to the observation platform. Once outside it was clear in the short time I was gone that the area of illumination had increased in size and a few minutes later I texted Chris and told him he'd better get up here because he was going to miss something awesome. When he arrived the drama was just beginning and within 10 minutes the sky was ablaze with color, eventually peaking at this moment and then quickly disappearing. I'll have to admit, I've shot a lot of sunrises and this is probably been the most beautiful I've seen. What a great way to start off Halloween! Sunrise Cumberland River Cumberland Falls State Park Kentucky After 4 straight weekends of visiting Red River Gorge in the Daniel Boone National Forest it was time for a change of scenery and to go spend some time at another one my favorite haunts, Cumberland Falls and the Big South Fork National Recreation Area in southern Kentucky. This trip I was joined by my wonderful other half Lisa and what a great time we had shooting the natural beauty and eclectic culture of the area. 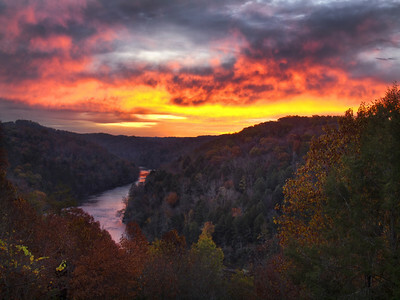 We started our first day of the trip wanting to capture sunrise and the plan was to shoot it from DuPont Lodge in Cumberland Falls State Park. Well, until a horde of young folks bombed the overlook area. Skies were clear but there was fog in the river gorge so hoped into the car and drove down the hill towards the falls. To our disappointment there was no sign of fog at the falls parking lot or Gatliff Bridge but just before the bridge I saw a road to the left that I had never drove up before with sign that pointed "Picnic Area." The fog was upstream so knowing we had nothing to loose we headed up the road to see how close we could get to it and after a short time it ended in a roundabout. Undiscouraged I looked around and saw a trail that followed the river, right towards our goal, so off we went. After walking about 300 ft, I found a side trail that dropped down riverside where a short distance upstream there it was . I hadn't realized it when we first began shooting from this angle but the sun rises directly over the river. As the sun rose, the colors of the fog changed with it but what really blew our minds was when the fog was just thin enough to allow a muted sun to shine through. Wow! What an unexpected scene and one that was all the more special because I was able to share the experience with my best friend! 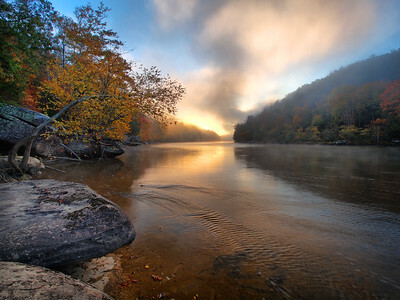 Sunrise Cumberland River Cumberland Falls State Park Kentucky One of my favorite moments this year as a photographer was getting to shoot sunrise this Autumn along the Cumberland River in Cumberland Falls State Park with my Honey, Lisa Sullivan. She had been wanting to shoot in fog for some time and she got her wish, and boy was I happy she did! 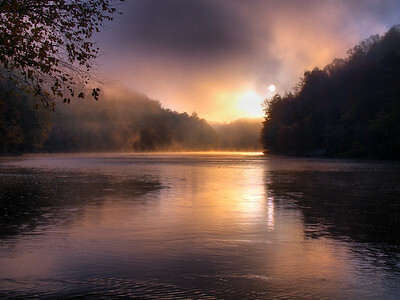 The sun rose directly downstream and as the fog began to burn off it created an amazing scene of light! You couldn't ask for a better start to the day. Cumberland River Cumberland Falls State Park Kentucky Captured downstream from Cumberland Falls, after waking up at DuPont Lodge and finding we were socked in on this Autumn morning Chris and I decided to head down to Cumberland Falls to see if it looked cool in the fog. Well it didn't, at all. So we decided to walk downstream since neither of us had ever walked there before and see what would happen. The fog was really thick here but as we made our way along the river it slowly began to lift. We began setting up and shooting as we made our way downstream. Finally we got to a point we couldn't go no further and the fog had almost thinned out too much. This was my last shot before it completely cleared up. Being that this was my first visit to this section of the river I just loved the massive house sized boulders lining the shoreline surrounded by the last of the Autumn holdouts standing high above them. 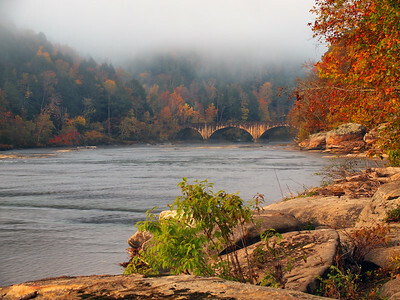 Gatliff Bridge Cumberland River Cumberland Falls State Park Kentucky Back in October 2015, my Lisa and I spent the weekend during peak fall foliage at Kentucky's Cumberland Falls State Park. We got up to shoot sunrise from the Lodge deck our first morning but everything was socked in with fog. Lisa was super excited there was fog since she doesn't get many opportunities to shoot in those conditions and wanted to go somewhere else, so we drove down to falls parking lot where we found out the layer of fog was hanging about 40 ft over the river. On a whim I decided to drive the road on the opposite side of the lot that followed the river upstream. The road led a lot further than I thought to a little roundabout with a trail head that followed further upstream. "Wanna go check out upstream?" I asked. "Sure!" she said. So out of the car we hopped, collected our camera gear and began to follow the trail. It wasn't long till we found a side trail to the river and we followed it to the rocky shore. After witnessing a spectacular sunrise event I turned my attention downstream. In the distance the morning light rested upon the Edwin Moss Gatliff Memorial Bridge as above the fog nestled in the changing trees above. Completed in 1954, it is one of the more famous bridges in the state and it's one that I've wanted to shoot for some time, unfortunately a massive log jam on the northeastern side of the structure had formed over the last couple of years making the compositions I had in mind very unattractive. I really liked this view as I'd never seen a photo from here before and that log jam I wasn't too happy about was completely out of site! 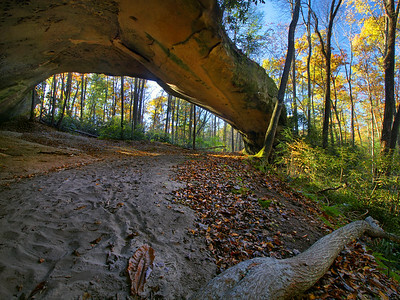 Daylight West Arch Daniel Boone National Forest Laurel County Kentucky Laurel County Kentucky is a mecca of awesomeness and it's loaded with arches and waterfalls! Of the 13 arches Chris and I visited a couple weekends ago only 3 were not located within the county boundaries. 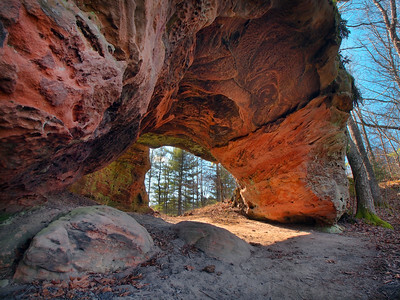 Located in the Daniel Boone National Forest along a forest road are the Daylight Arches, one East and one West and they are only about 30 ft. apart from one another. If you're not paying attention you could drive right past them. The ho-hum attitude I got from Chris about them as we made our approach my expectations were less than positive and from the roadside perspective it did seem that maybe his presentation might have been warranted, but then I walked around back. This is Daylight West Arch and I'm going to have to admit, I loved it. 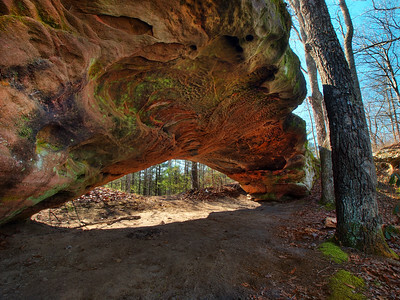 At 21 ft wide and 8 ft tall (thank you for the dims Mervin Wood), the color of the sandstone is gorgeous and the shape of the arch is just cool. There was a bit of disappointment here as well, as someone had blotched some neon pink paint on the underside of the arch. I'm not sure why someone would feel the desire to deface a landform that took eons to form but whomever did should be ashamed of themselves. Sadly I'm seeing a lot more of this happening to our arches and it's sad. God forbid I run across someone assaulting one. The outcome will not be good for the offender. Pink paint aside, this really is a pretty arch and I really am glad I got to spend some time with it! It's a beauty! 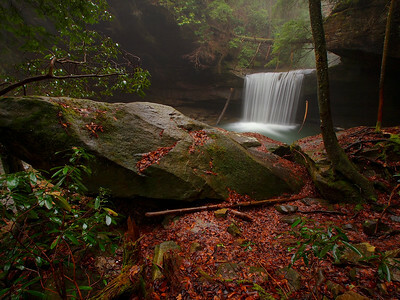 Located in the Daniel Boone National Forest three miles downstream from Cumberland Falls. Dog Slaughter Falls Dog Slaughter Creek Daniel Boone National Forest Kentucky In the spring of 2018 I got to spend some quality time running around Kentucky’s Cumberland Falls and the Big South Fork National River And Recreation Area with some good friends! Our last evening there everyone was pretty tuckered out but myself and Dave Halbig decided to press on and visit one of my favorite Kentucky waterfalls. Though I wish we had of gotten a little earlier start we arrived at the trailhead around 6:45 for the moderate 1.3 mile hike, then made it to the waterfall at 7:30. Though I’ve been to Dog Slaughter Falls many times over the years, only one time did I not have super funky light conditions. I realized that every time I had visited the falls that I was there in morning, so for change of pace I decided to switch things up and visit in the evening. What a difference! The sun was far out of sight from inside the small gorge, and though there were blue skies above, conditions were near perfect! I came away with what I think are the best photos of this waterfall I’ve taken in over 6 years! Though we were limited by time and daylight we were able to work the falls till around sunset. We then packed it up and bolted out of there, making the trek out in 32 minutes and arriving at the car with only minutes to spare where we would have had to pull out the head lamps. Damn good times and a hell of a workout I must admit! Dog Slaughter Falls Dog Slaughter Creek Daniel Boone National Forest Kentucky Kentucky's Dog Slaughter Falls in the Daniel Boone National Forest is one of the most beautiful settings in the state! This is a photo I took earlier this year with my good friend Dave Halbig! 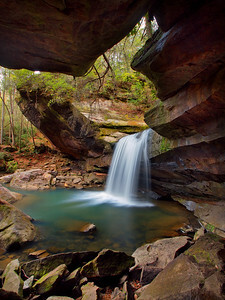 Double Falls Daniel Boone National Forest McCreary County Kentucky The first time I saw this waterfall tucked away in Kentucky’s Daniel Boone National Forest I was standing with my good friend Chris Morris 40 ft above it on a cliff along the slot canyon that leads to it. That very spot was also where I met McCreary County explorer and regional arch expert Mervin Wood for the first time. Bright sun on that visit just had us out exploring without our camera equipment. That was over a year ago. Recently I finally got to visit this beauty from below with the guidance of good friend Greg Davis. Requiring a fairly easy scramble down the cliff and fighting some thick rhododendrons we were able to make it to the wataershed and creekwalk our way to the waterfall. This place is amazing as one stands beneath the high cliff walls, you get the sense you've been transported back in time to a primordial place rarely seen by others. Though I didn't get to spend as much time here as I wanted due to waning late evening light, I look forward to returning in the near future after a good rain!